Nadda said road traffic deaths and injuries are forecast to rise by about 65% by 2020. In low and middle income countries, these fatalities are expected to increase by 80% and the majority of these victims are the vulnerable road users (VRUs) - pedestrians, cyclists and two-wheeler riders. 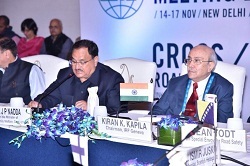 Nadda further said that the political commitment and a will to achieve can bring about significant and rapid decline in road injuries and requires planning at all levels, capacity creation, involvement of all sectors and good data.